Join a leader in transfusion medicine. 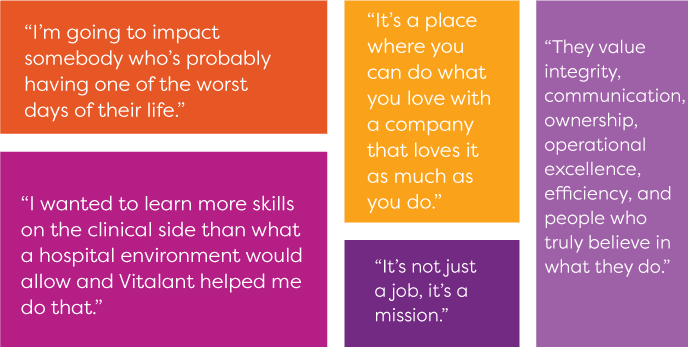 Employees often come to us as a first step in their career, and they find a lifetime worthy place to stay. From mentoring and support programs to an always evolving array of benefits. There’s a lot of room to grow, to try new things, to do exciting and challenging work, and to succeed. You can advance into different work areas and with our network as large as it is, experience a blend of work hours and life balance. The opportunities for you to build skills, learn new things, and be inspired are perhaps our greatest strengths and are the reasons why we’re always growing in the right ways. Make a difference in the lives of millions of people who need our help. We’re a nonprofit organization committed to helping you grow and develop as we serve the country. 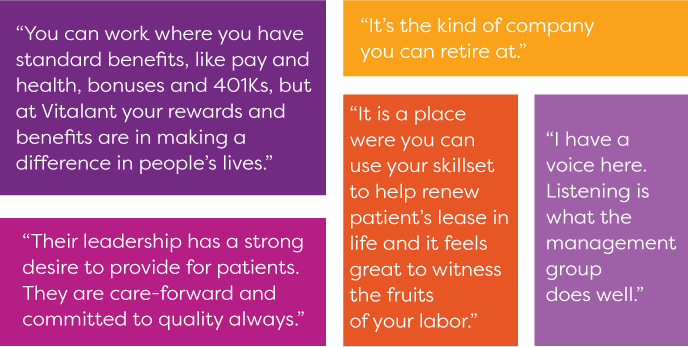 See what our people say about working at Vitalant. Benefits available for 30+ hours per week employees. Every job at Vitalant is one where you can feel good about giving back. At the end of every workday, you’ll know you made a difference in your community. Giving blood is a lifesaving mission, one that more than 780,000 blood donors know from personal experience – many of whom give blood because it’s the right thing to do or because a family member or friend needed a lifesaving transfusion. 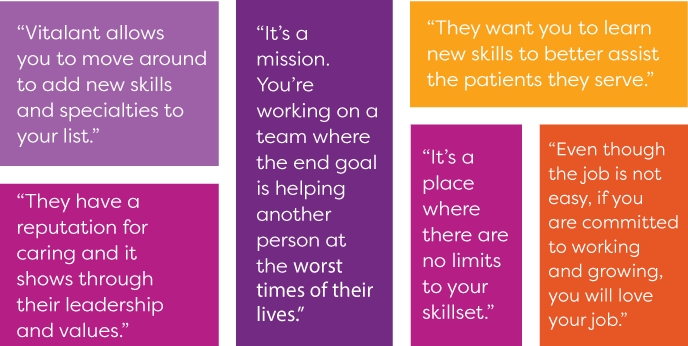 As a part of Vitalant, you will meet these caring and committed people every day, and you will feel pride in helping us provide blood to hospitals for the patients who need it. In addition to our phlebotomist jobs, look ahead and explore the vast career opportunities in other parts of our business. As the nation’s second largest blood provider, Vitalant’s strength allows its reach to extend into blood donor and patient testing labs, pharmaceuticals and biologics distribution, blood sciences research institute, plus technical and professional job opportunities in all 24 states in which we operate. View open positions throughout our organization by clicking on any of our other lines of business below. Creative Testing Solutions, a co-owned venture, is the largest independent blood donor testing organization in the United States, with high volume laboratories located in several major metropolitan areas across the country. Our transfusion medicine research team at Vitalant Research Institute is among the most respected and productive in the world. Located in Denver and San Francisco, the Institute participates in research projects from Asia to Europe and the Americas. With a reputation for outstanding service and all-hours responsiveness, BioCARE and its specialty pharmacy, CanyonCARE Rx, are among the leading distributors of hemophilia products. Respect. Integrity. Teamwork. Excellence. This is what we stand for. As employees of Vitalant, we pride ourselves in every aspect of our work, making sure that we deliver a comfortable, convenient blood donation experience to all of our donors – young and old. How we collect blood is the same process at every one of our locations, but no day is quite like another when you are part of this team. Whether you are conducting a blood drive around town on one of our highly recognizable buses or greeting by name one of our frequent donors at a storefront donation center, you’ll be having fun. As a representative of our organization in the community, you’ll meet new people every day and make friends along the way. At Vitalant, your responsibilities can increase quickly, and you’ll have the opportunity to continually grow your skills and your career. Scroll down to get started. We’re a nonprofit organization committed to making a difference in the lives of millions of people who rely on us to provide blood where and when it’s needed. Join us… Complete the form, and a recruitment representative will contact you directly to discuss the open positions that match your qualifications and interests.